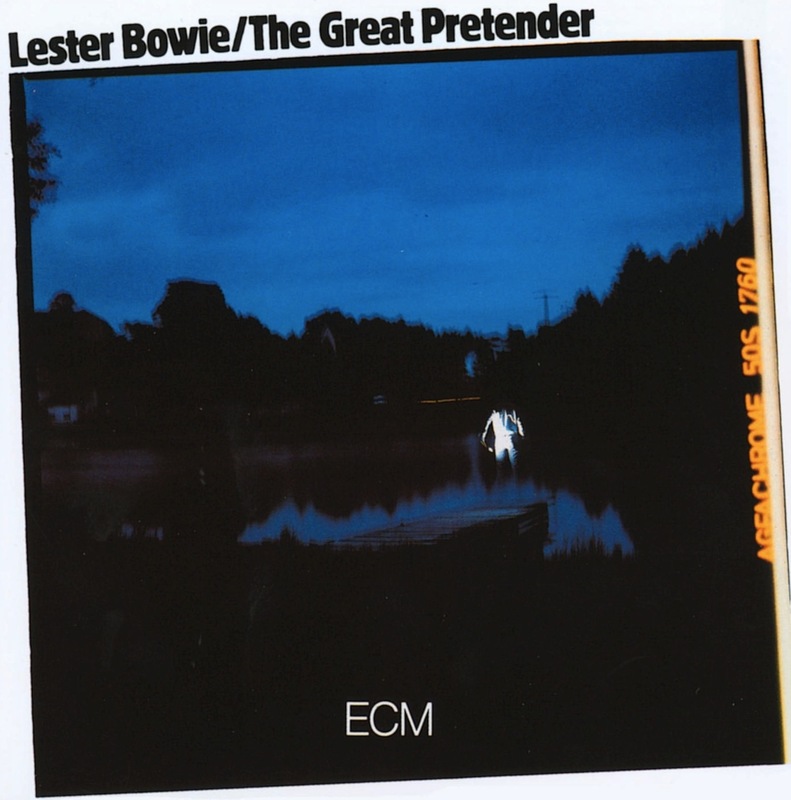 The title cut on Lester Bowie’s The Great Pretender comes of course from The Platters, the influential vocal group whose other hits, “Only You” and “The Magic Touch,” catapulted the group’s success through the rock n’ roll charts of the 1950s. Bowie’s investment in popular music’s connections to jazz set him a world apart. Second perhaps only to 1978’s The 5th Power, his debut for ECM as leader works wonders with its namesake. Where the original opens with quiet fortitude, this massive 17-minute rendition does so even more, the pianism of Donald Smith breathing a soulful mist upon a landscape that sometimes swirls with unanticipated gales. Fontella Bass and David Peaston are our doo-wop backups, their presence making the music that much more phenomenal. From Hamiet Bluiette’s heady baritone solo to the swampy rhythm section, Bowie has plenty of gum to chew in his horn. No Bowie experience is complete without an inoculation of whimsy, and this we get in his rendition of “It’s Howdy Doody Time.” Phillip Wilson’s bright snare and Bowie’s fluttering elaborations share the air with Smith’s long slides. These morph into an evocative Fender Rhodes in “When The Doom (Moon) Comes Over The Mountain,” a wild chase backed by Fred Williams’s popping electric bass and the late-night sprawl of Bowie’s blatting. What begins as an overused Latin riff in “Rio Negroes” quickly transforms into a foray of architectural proportions secured by solid improvisational beams. Rich bass lines and rim-work carry us out in style. “Rose Drop” again looks through a glass playfully, only this time with a deeper drop. The tinkling of toy piano sparkles in Bowie’s waning sunlight, overflowing with half-remembered sentiments, each a photograph pasted in a scrapbook like no other. Lester Bowie is like the moon. His is a field that waxes and wanes, haunting us with intimations of a distinct face, even as it harbors a dark side that we never get to see, except through the grace of studio technology, which allows us a glimpse the deeper intimations of his craft. We get this most readily in “Oh, How The Ghost Sings,” which from the evocative title to its flawless execution rings with the after-effects of a temple bell, the actual striking of which we never hear, and ends on a protracted, distant wail. The material on The Great Pretender is all great and lacks a single pretender, and has been deservedly consecrated among ECM’s Touchtones.